Since 2005, Regulation has demanded tests are carried out on prospective RPD wearers, by Employers, to ensure that deviations in protection levels; owing to individual variation in how the subject mask fits; do not fall outside the bounds of expected deviation. We provide on site fit-testing, always subject first to a review of your challenges and risk assessment, at a minimum charge of £500, catering up to ten people. Thereafter, a per capita charge of £50 per person is added. Results and records are transmitted electronically, to the client's personnel department and complete confidentiality is maintained between us, the employee and the employer, thus. Where the client site is further from Telford than 25 miles, there is also made a call-out charge of £60 net. The methods prescribed for tests are generally described in HSE publication HSG53 and in HSE Operational circular, OC 282/28, which are downloadable from our information section and, of course, from the HSE's web site. The method best used is always determined by the manufacturer of the RPD and we will keep to such methods, unless there is good, scientific reason for alternatives. In essence, where low (4<>200) Nominal Protection Factors: thence 'Fit-Factors': are acceptable - as will be derived from your Risk Assessment- simple methods involving subjectively sensing 'mask break through' are used. These usually involve placing the subject is a non-toxic challenge atmosphere but one which is easily detectable by smell, or taste, or both. 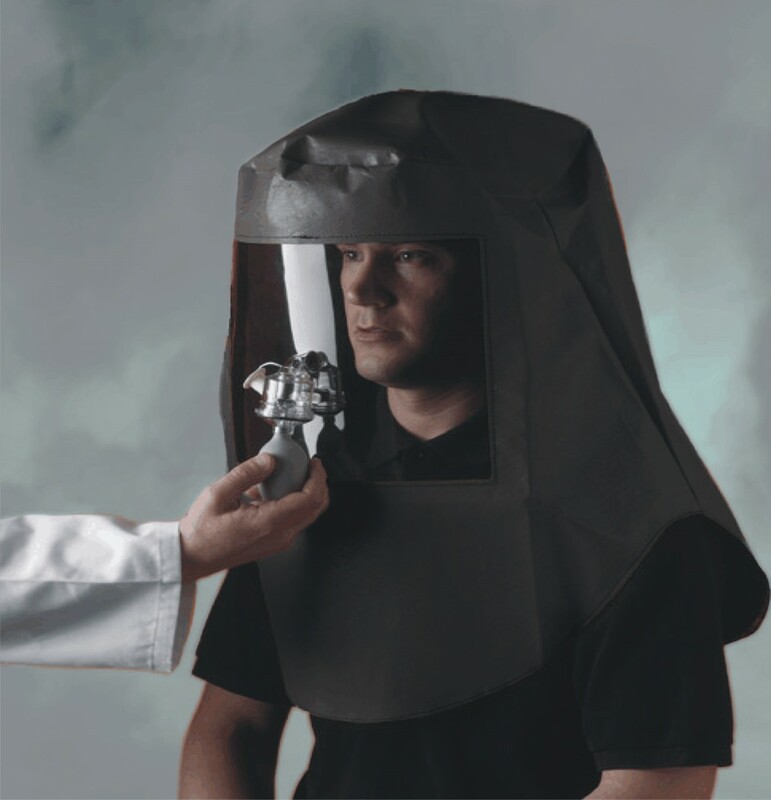 Sensitivity to the challenge, by the wearer is first tested and, thereafter, the RPD is worn and subjected to a higher concentration of the challenge. The challenge usually comprises two aerosols, where one or both may be used, depending on the subjects threshold sensitivity to each. One has a bitter taste, the other, a sweet taste. Where higher Fit-Factors are required proven; then quantitative methods of measuring the 'break-through' are used. Without discussing detail here (See: note, FT0906 ) there is great controversy and doubt as to both the accuracy and consistency of using these methods and, indeed, to their relevance. I am confident that both aspects will be revised, during the next term of Government. Therefore: when we conduct Fit-testing, should the manufacturer's recommended method be inappropriate, in our view, we will qualify this in your report, having conducted alternate methods, usually prescribed in HSG53, or otherwise, for which there is published, proven protocol by learned bodies such as the ISRP. We do NOT use methods scientifically misleading, or unsupportable! Thus your Helios Fit-test report will dove-tail with your Risk Mitigation report, providing technical reference to the tasks it covers and NEVER simply relating to the 'Go, No-go' type of testing that has become the habit of a box-ticking society. We will spell out the properties and cautions of the evident challenges and facts of all reason for our recommendation and suggested user training. Regulation currently requires that the method of fit-testing ascribed appropriate be that recommended by the CE license holder. Thus, the responsibility for due efficacy is not that of Government departments; quite unlike previous systems of RPD approval, prior to 1986. It would be foolish of manufacturers therefore to recommend inappropriate fit-testing methods, with regard to the performance of the RPD and taking no account of the purpose and method of its application. Yet, possibly from political pressure from Representative Bodies, some RPD manufacturers have done so - especially regarding breathing apparatus. The wise employer should approach such resulting pit-falls with due caution because erroneous convention will not mitigate his responsibility for consequent injury. During the past five years there has been well-enough demonstrated danger from presuming 'Fit-tested' wearers 'safe' in challenge atmospheres where too little attention has been given to the suitability of the RPD for specific challenges - especially where toxic challenges are soluble and may therefore transmit, in sweat, through mask seals. And yet, the notional selection of PPE accorded with all current Test Protocol! In controlling such danger, the form of CoSHH data sheets; meeting the minimum legal requirement but conveying little, meaningful information; has played a large and negative role. Where high PFs and Fit-Factors are needed - in very toxic challenges, Risk Assessment usually calls for positive pressure breathing equipment. Clearly, no experienced employer would presume safety without first checking appropriate suitability and face-fit of masks, for individuals. But the purpose of positive pressure RPD is to provide protection without necessitating 'perfect' face fit. Indeed there is no such ideal of perfect face-fit. Thus, for Air supplied, positive pressure breathing masks, the function of quantitative Fit-Testing becomes both specious and misleading; since there are strong grounds to suppose the prescribed methods significantly inaccurate but other work published in the ISRP journal, as long ago as 1984, suggests a fully bearded wearer (for example) will so achieve Protection Factors in excess of 10,000! At about that same time, the HSE's laboratory, in Sheffield, verified Protection Factors of about 100,000 commonly attained in its clean-shaven, wearer trials panels. No subsequent work has given cause for any contradiction of result. Click the button below to add the Qualitative, respirator Fit Testing: (10 people session) to your wish list.